Yeah, so. Cool. This makes Hugo nom number three. Going to be an interesting year. But all things considered, I’m pleased; I’m actually going to have a hard time voting in my category because I like some of my competitors better than I like my own work. Congrats to those of my fellow nominees who earned their spots with skill, creativity, and fair play! 100% deserved! I don’t mind saying right up front that you were my topmost pick. 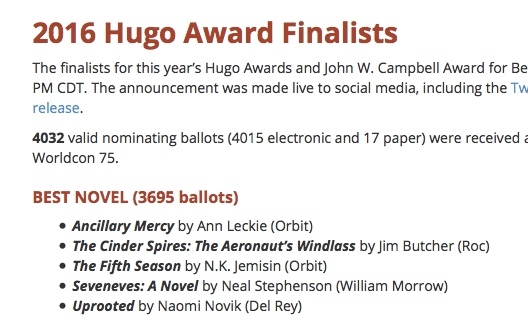 Ancillary Mercy was solid but not as ground-breaking, Seveneves doesn’t deserve the Hugo, so it’s between you and Novik for me. Congratulations on a well deserved nomination. You may be torn but I’m not. I’m glad Ancillary Mercy and Uprooted are there too, but The Fifth Season is tops! Fifth Season is my pick. I thought about that book for a long time after finishing it. Congratulations and good luck. Congratulations! The Fifth Season was the first book of yours that I read. I loved it, but I also loved a lot of what Ancillary Mercy did as well. I may have to reread them both to decide. I haven’t read the other three nominees, so it is time for me to get reading. I’m a fan of Butcher’s Dresden Files, but I wasn’t so much a fan of the Codex Alera, so we’ll see where The Aeronaut’s Windlass falls for me. It was one of two picks for this month for the Sword & Laser book club. Everyone who commented appeared to love it. Very well deserved. I’ve never read any of your novels before but I’m so glad I picked this up. The Fifth Season is one of the most engaging and moving stories I’ve read in a long while. You seem to have an amazing ability to construct a stunningly original alternative world without resorting to artificial exposition, but in way that emerges naturally from your characters and their situations. I’ve got my fingers crossed for you! I’m so glad that The Fifth Season has been recognized! This truly well deserved. The book is completely original, compelling, breathtaking. I loved it. In fact, I turned the last page, gasped, then turned back to page 1 and read the whole thing through again. Completely amazing. I can’t wait to find out what happens in the sequel. Congratulations, and I’m rooting for you! I’ve greatly enjoyed all your books to date, and The Fifth Season is my favorite so far. It’s just so stunning, characters and worldbuilding both. The first thing I did when I finished the book was go on Amazon to see when the next one would be out. The second thing was to start reading again from the beginning. hell yeah! Very well deserved, this book was awesome and I say that as a gay woman and an environmental scientist! The Fifth Season has been my top choice all along. I look forward to ranking you first. Congrats!